Recently my collection has been growing in too many areas as once again, I have been drawn into looking through the “to be painted pile”. To be fair these have been sat on my painting shelf for the last 4 months partly done but I finally dragged myself away from other areas to finish them. I think the issue was how to paint Yellow, a lot of it and yet still look good? 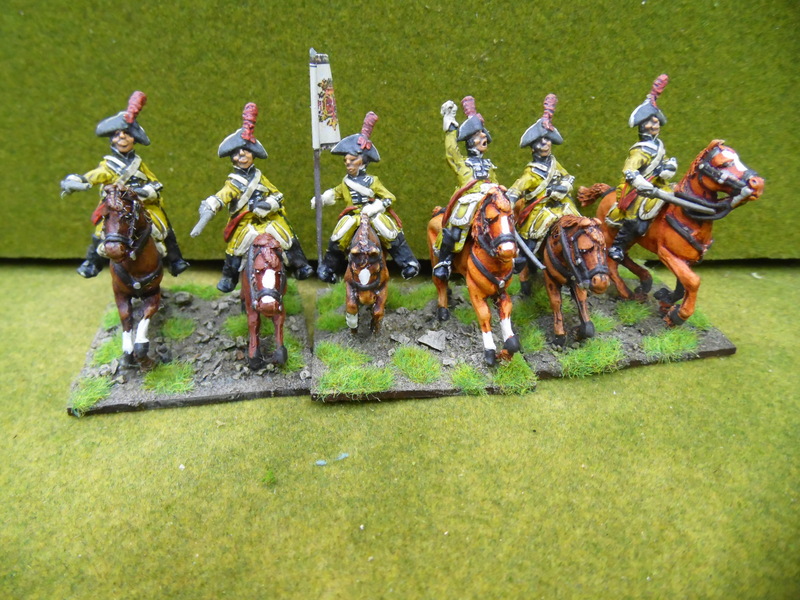 After a few false starts I settled on “Miniature Paints’ – Mustard” with a wash of Army Painter strong wash. 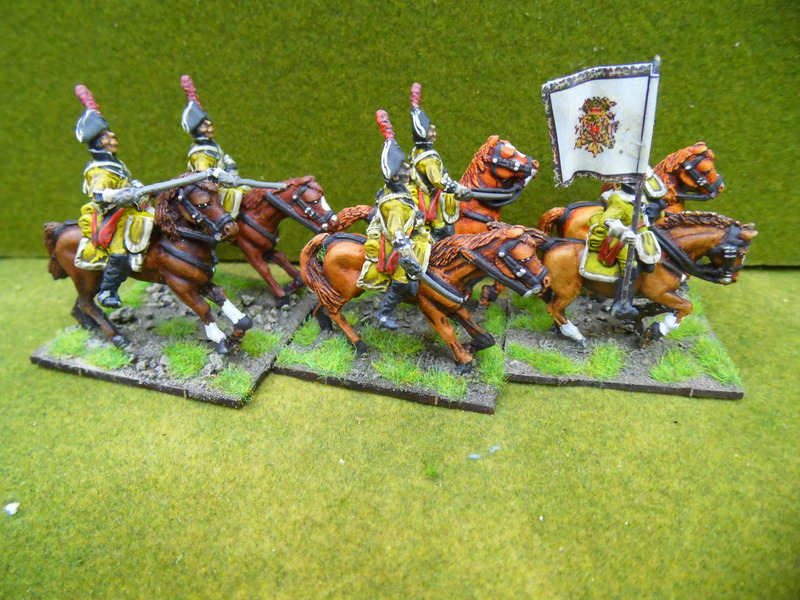 They are from the Elite Miniatures range and they were bought to go with my Spanish collection. The figures are not some of the best I have ever seen from Elite but they are the only ones they make. The choice of pose is poor; one officer, musician, standard and trooper. The detail on the trooper is less defined, when compared to their normal quality. 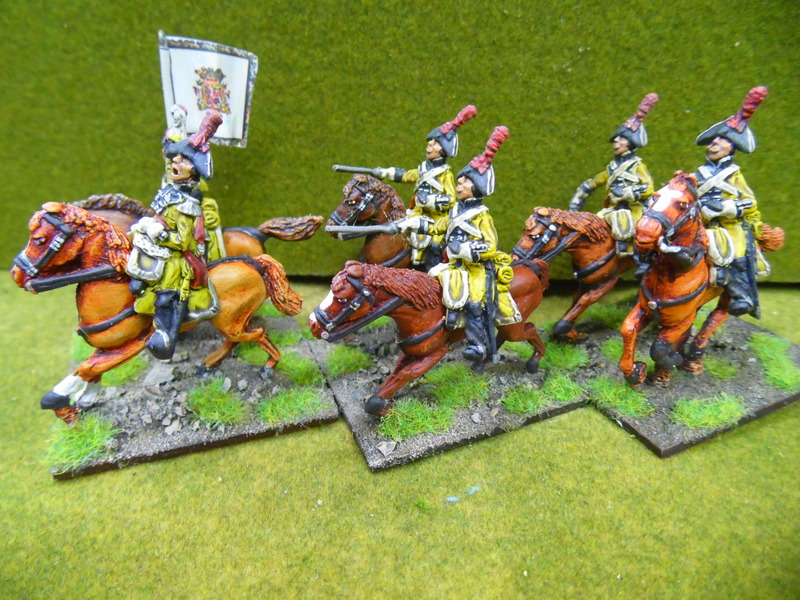 Like most Spanish dragoons the uniform was Yellow, a lot of yellow. Trousers, jackets with red turn backs, waistcoats. The only distinction was the facing colours on the collar, cuffs and lapels. In this case Black. Saddle cloth and pistol holders in yellow with white edging. Bicorn black edged in white with red cockade and plume. 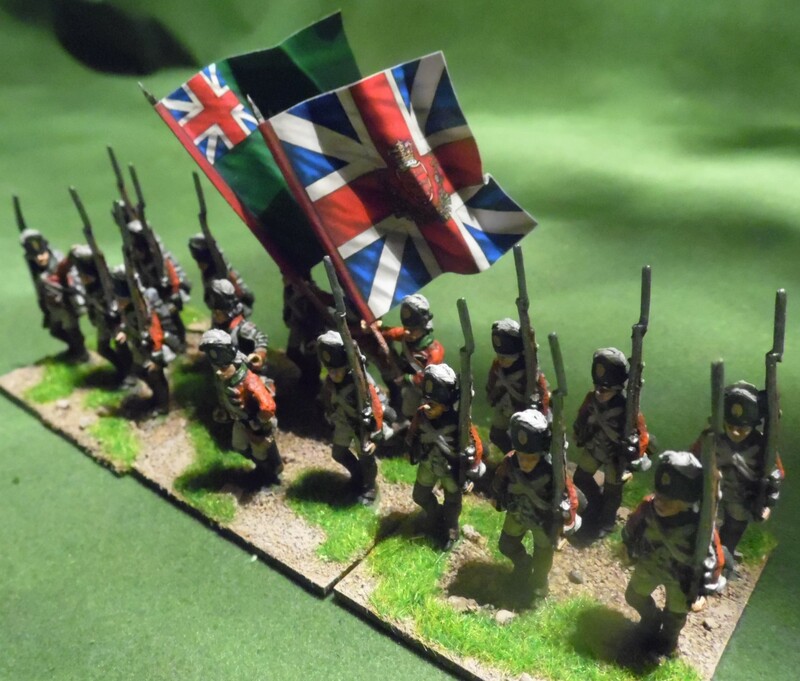 Below are a few pictures of my finished unit from Perry Miniatures. 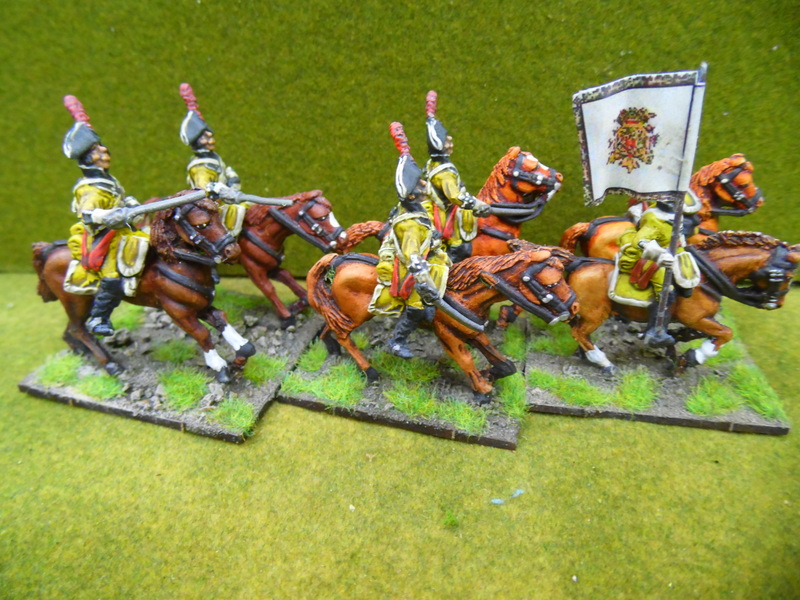 As some time I will do some foot.While painting my latest unit I wondered if there would be any benefit in sharing what I have found out about the unit? 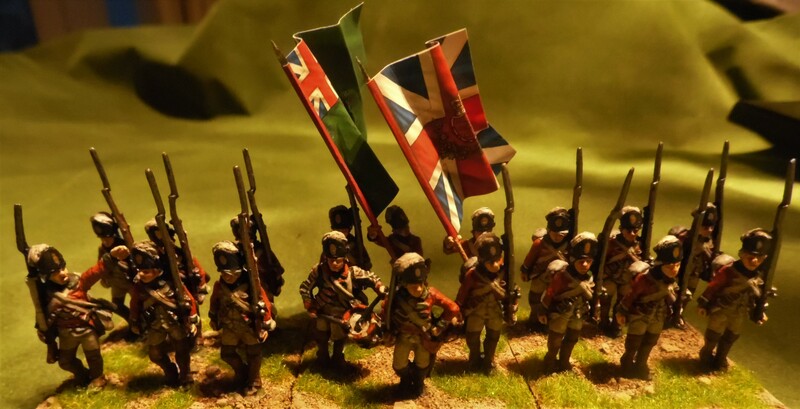 The Queen’s Rangers are probably the most represented table top Loyalist unit that fought during the American war of Independence. Originally raised in 1776 by Robert Rogers of “Roger’s Rangers” fame. During the AWI the commander was John Graves Simcoe. They fought at many battles including Brandywine, Germantown and Monmouth and many skirmishes. Originally an infantry regiment, Simcoe remodelled it into a “legionary” corps of consisting of both horse and foot. 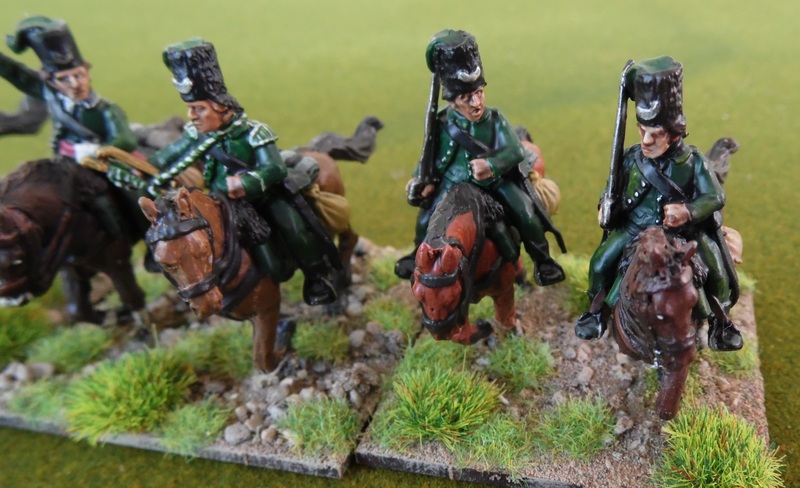 Their distinctive headgear is rumoured to have come about due to a rider being shot by a Hessian Jaeger who mistakenly thought they were American. To avoid any mistake again a cap, made of black cloth (reinforced inside with leather or pasteboard) and decorated with a green “bag” hanging from the crown and the crescent device was introduced. 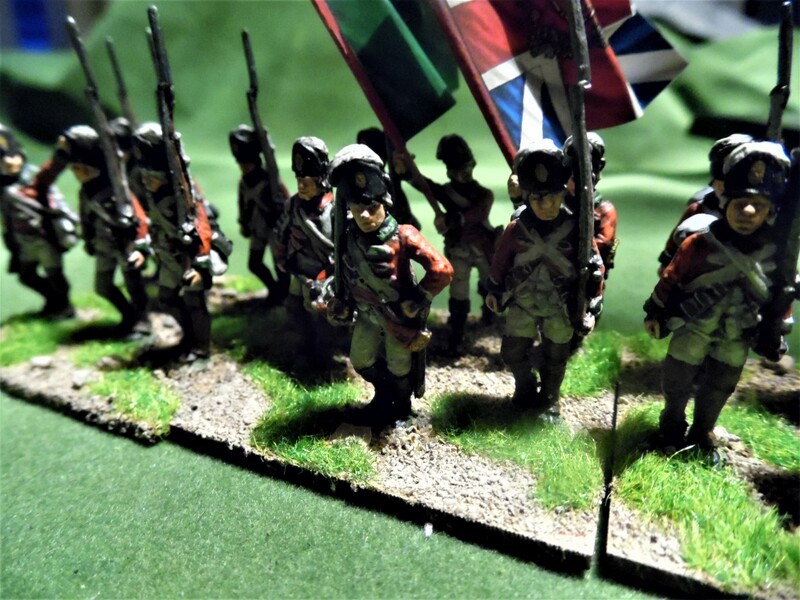 Below are a few pictures of my finished unit from Perry Miniatures. Some time I will do some foot to go with them. Jacket – Green. I have done mine with Green facings as well to collar, cuffs and turn backs. Musicians and Officers have white piping to cuffs. I have also seen mention of Black facings. Trousers – Green, Leather or later white.